What if old coal mines could provide us with clean and renewable energy ? No, I am not giving credence to clean coal, I am writing about a great idea a Dutch village had. Heerlen inhabitants thought about repurposing their old coal mine – flooded with hot water – and thought about tapping all this heat with geothermal energy. Now, what if in the future all currents coal mines, once abandoned because of high CO2 prices, were to provide geothermal energy ? That would be awesome. It’s hot down there, inside the Earth. And to tap that energy, all we need is giant holes in the ground. Giant holes can sometimes be a bit expensive to dig, but there’s some good news. The world already has a bunch of giant holes…from centuries of coal mining and exploration. And as any early 20th century coal miner will tell you, it can get hot down there. The Dutch town of Heerlin has just discovered how useful old coal mines can be. 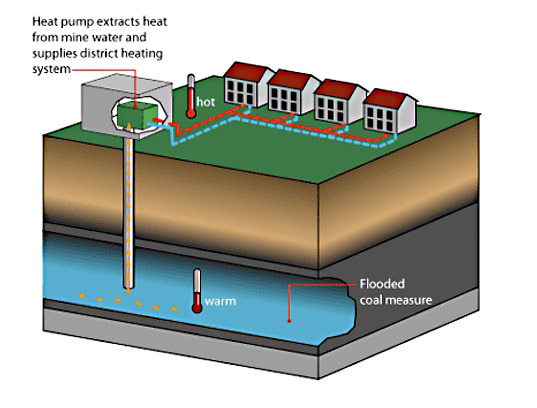 An abandoned coal mine that’s since flooded with ground water is being re-purposed to provide heat and hot water to 350 businesses and residents. The heat in the mine water is exchanged into clean drinking water so, no, the residents aren’t drinking coal sludge. Unfortunately, a fix for 350 people is not a fix for the world. But there are certainly no shortage of mine shafts in the world, we’ll just have to see if the Dutch (or someone else) is able to scale it up. If you want more on this topic, please read the original news on Inhabitat. What do you think about both topics ? I look forward to reading your opinions !